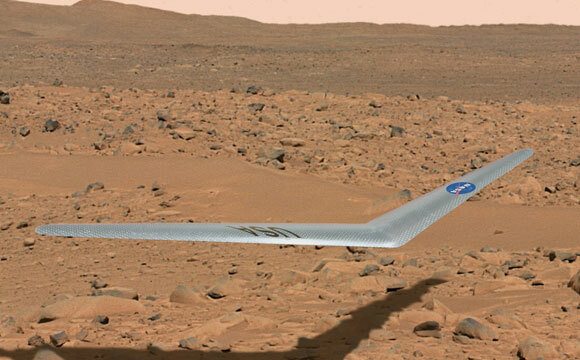 This illustration shows what a Prandtl-m might look like flying above the surface of Mars. Later this year NASA researchers will test prototype aircraft aerodynamics that could lead to the first aircraft on Mars. When an aircraft makes its first flight on Mars in the 2020s, a NASA Armstrong innovation may have made it possible. A prototype of the Preliminary Research Aerodynamic Design to Land on Mars, or Prandtl-m, which is a flying wing aircraft with a twist, is planned to be ready for launch from a high altitude balloon later this year. The Prandtl–m will be released at about at 100,000 feet altitude, which will simulate the flight conditions of the Martian atmosphere, said Al Bowers, NASA Armstrong chief scientist and Prandtl-m program manager. Because the Prandtl-m could ride in a CubeSat as ballast aboard the aeroshell/Mars rover piggyback stack going to Mars in 2022-2024, the additional weight would not add to the mission’s cost, he said. Once in the Martian atmosphere, the Prandtl-m would emerge from its host, deploy and begin its mission. The Flight Opportunities Program, which is managed at NASA Armstrong, has agreed to fund two balloon flights during the next several years and potentially a sounding rocket flight following that to demonstrate how the flier would work on Mars, Bowers said. The flights will be at one of two locations – Tucson, Arizona, or Tillamook, Oregon. NASA’s Ames Research Center at Moffett Field, California, manages the Flight Opportunities solicitation and selection of technologies to be tested and demonstrated on commercial flight vehicles. “That mission could be to 450,000 feet and the release from a CubeSat at apogee,” he said. “The aircraft would fall back into the Earth’s atmosphere and as it approaches the 110,000-to-115,000-feet altitude range, the glider would deploy just as though it was over the surface of Mars. 2 Comments on "Could The Prandtl-m Become the First Mars Airplane?" While innovative, this is obviously a very short lived, one time device. I would think that a much more useful device would be perhaps something on the order of a helium filled balloon with solar charged electric steering capability like a helicopter. It would be filled on site with helium to the point of being almost weightless to conserve electrical power. Mission profile would be sent from NASA to the local controller which would then control the balloon instruments in real time. Equipped with a camera it could effectively map vast sections of the planet and, with a claw, even perhaps distribute small GPS arrays around the area so distances would be accurately measured and even to land and pick up small samples to bring back to the Rover for analysis. Yes I do have a better idea. Use the billions of $$ to do this ridiculous endeavor, that taxpayers have to foot the bill for, to instead use that money to clean up the DECADES of pollution at places like Cape Canaveral from rocket launches.